Installation from Viewplot setup "Complete Installation setup"
When installing Viewplot setup the first time and after receiving the USB License key. Attach the USB Key after the installation from Viewplot is completed ! unrecognized by the operating system. 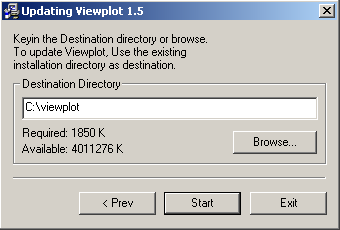 Start the setup program by pressing the Run button or double click on the "viewplot_setup.exe"
The Security Warning from XP can be ignored. 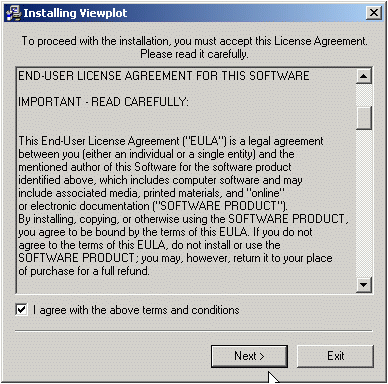 Accept with the Agree button the License Agreement and press the Next button. Start the installation with the Start button. 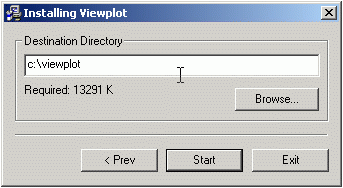 A Viewplot Programs Group is add to start Viewplot and or to Un-Install it. Manuals and sample files are located in the installation directory. 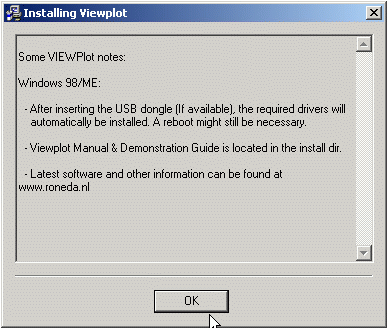 Start the setup program by pressing the Run button or double click on the "viewplot_update.exe"
Start the Update installation with the Start button.